Emmentaler or Emmental is a yellow, medium-hard cheese that originated in the area around Emmental, in Switzerland. It is one of the cheeses of Switzerland, and is sometimes known as Swiss cheese. While the denomination "Emmentaler Switzerland" is protected, "Emmentaler" is not; as such, Emmentaler of other origin, especially from France and Bavaria, is widely available and even Finland is an exporter of Emmentaler cheese. Emmentaler has a savoury, but not very sharp taste. Three types of bacteria are used in the production of Emmentaler: Streptococcus thermophilus, Lactobacillus, and Propionibacterium freudenreichii. In the late stage of cheese production, P. freudenreichii consumes the lactic acid excreted by the other bacteria, and releases carbon dioxide gas, which slowly forms the bubbles that make holes. Failure to remove CO2 bubbles during production, due to inconsistent pressing, results in the large holes ("eyes") characteristic of this cheese. 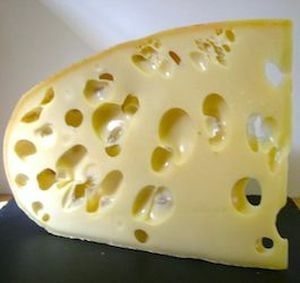 Historically, the holes were a sign of imperfection, and until modern times, cheese makers would try to avoid them. Emmentaler cheese is used in a variety of dishes, including some types of pizza, and ravioli, where it is often accompanied with Prosciutto. Emmentaler Switzerland AOC has been registered since 2000 as an appellation d'origine contrôlée (AOC). This “original Emmentaler” has to be aged for a minimum of four months. It is produced in a round shape with a natural rind and aged in traditional cellars. The original Emmentaler exists with different age profiles: classic - four months, reserve - eight months, and Premier Cru - 14 months. It is produced with raw cow's milk, adding only natural ingredients (water, salt, natural starter cultures and rennet). Preservatives or ingredients from genetically modified organisms are not allowed. Emmental AOC is still produced in small rural dairies. Emmentaler Switzerland Premier Cru is a special Emmentaler aged for 14 months in humid caves. It was the first cheese from Switzerland to win the title World Champion at the Wisconsin (USA) Cheese World Championships in 2006. It was nominated best cheese among over 1,700 competitors. For this achievement, it has received a place in the Historic Museum in Bern, Switzerland. In cooking, it is often put on top of gratins, or dishes which are put in the oven to let the cheese melt and become golden-brown and crusty. It is also used for fondue, in which case it is mixed with Gruyère cheese.